Dental infection and periodontal inflammation are common infections. They may result in mandibular osteomyelitis if appropriate therapy is delayed. Septicemia with resultant osteomyelitis is uncommon but may be encountered in the pediatric age group. Mandibular osteomyelitis may spread into the adjacent medial pterygoid or masseter muscles resulting in masticator space infection. Osteomyelitis is associated with pain and fever. In addition, patients with masticator space abscess will have varying degrees of trismus. Clinical examination will reveal redness and swelling over the face. 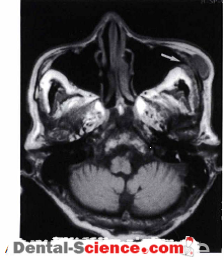 A discharging sinus may also be evident on inspection. Patients with dental and periodontal disease usually have a history of poor oral hygiene. 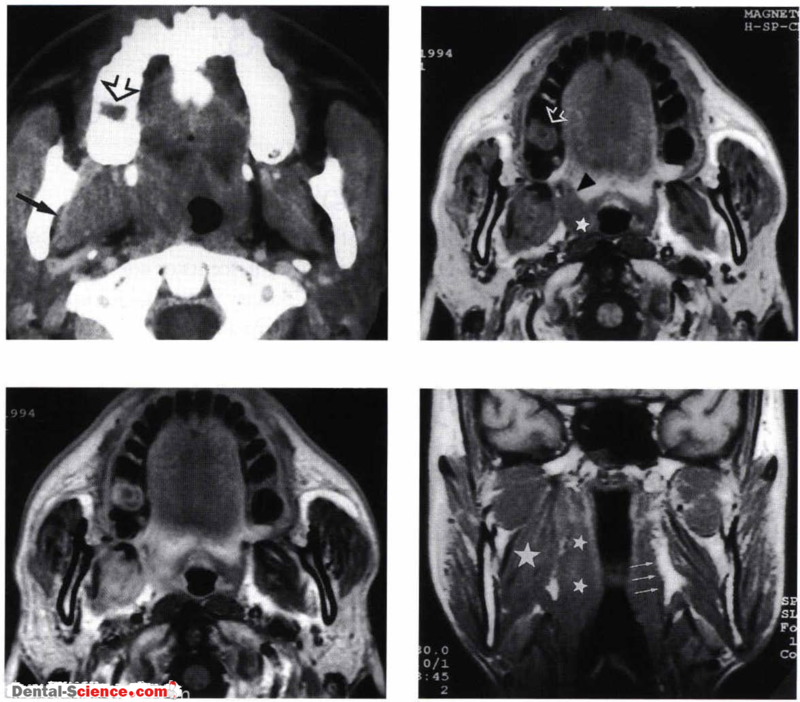 In some patients the underlying cause is previous irradiation for head and neck malignancy. The immune system may be further compromised by the institution of chemotherapy. The most commonly cultured microorganism is StaphyLococcus. However, a wide variery of anaerobes may also be found. The treatment consists of appropriate antibiotic coverage, removal of the infected tooth, and drainage of the masticator space abscess. Mandibular osteomyelitis is characterized by osteolysis and erosion of the involved mandible. This is associated with adjacent soft tissue swelling in the masseter or medial pterygoid muscle. Infections of the mandible may extend deeply into the sublingual space or superficially into the buccal space. Phlegmon is characterized by diffuse enhancement of the soft tissues. An abscess will have a low attenuation center with enhancement of the surrounding soft tissues. On T l -weighted M R imaging, the high signal intensiry of the mandibular marrow is replaced with intermediate signal intensiry in inflammatory tissue. 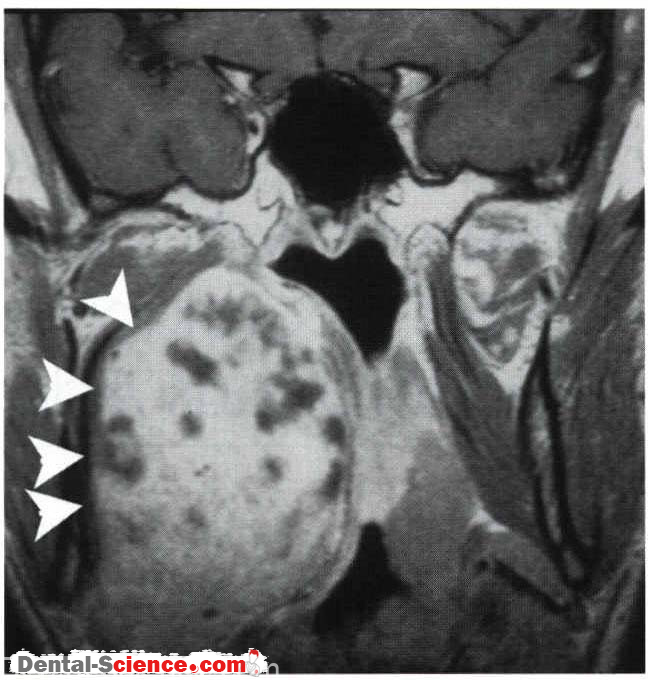 On T2-weighted images high signals can be seen in the marrow space and soft tissues of the masticator space. There is diffuse enhancement of the soft tissue with infections due to phlegmon. Abscess will show the characteristic enhancement. • In the evaluation of patients with a masticator space infection, bone algorithm must be obtained to evaluate for osteomyelitis of the mandibular or maxillary alveolar ridge from an infected tooth.